Free Pollard? Why not free Aldrich Ames as well. Juan Cole points out why the traitor Jonathan Pollard, long a cause for the Israeli and American Jewish right, should remain deep in the jail cell he so richly earned. 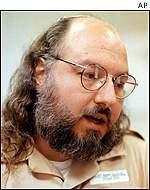 As for their demand that Jonathan Pollard be freed from US prison, where he is serving a life sentence for delivering mountains of classified information to Israel (and thence to the Soviet Union), it is monstrous. Pollard inflicted incalculable damage on the United States and is one of its most dastardly traitors. High-ranking US officers with an intimate knowledge of the case told Seymour Hersh that there is no doubt that documents he provided to the Israelis ended up in the hands of the Soviets. This happened either because Israeli intelligence peddled them to Moscow or because Israeli intelligence itself was penetrated by the KGB. By sending highly classified material out of the United States (for tens of thousands of dollars in a private account), Pollard initiated its transfer to Moscow as surely as if he had just dropped it off at the Soviet embassy. Pollard should never be released, and anyone who demands his release is no friend of the United States. Giving the signal that it is all right to spy intensively on the United States would be the worst possible move in these parlous times. Seymour Hersh explains exactly what Pollard gave to Israel, and the Soviets through them. The documents that Pollard turned over to Israel were not focussed exclusively on the product of American intelligence -- its analytical reports and estimates. They also revealed how America was able to learn what it did -- a most sensitive area of intelligence defined as "sources and methods." Pollard gave the Israelis vast amounts of data dealing with specific American intelligence systems and how they worked. For example, he betrayed details of an exotic capability that American satellites have of taking off-axis photographs from high in space. While orbiting the earth in one direction, the satellites could photograph areas that were seemingly far out of range. Israeli nuclear-missile sites and the like, which would normally be shielded from American satellites, would thus be left exposed, and could be photographed. "We monitor the Israelis," one intelligence expert told me, "and there's no doubt the Israelis want to prevent us from being able to surveil their country." The data passed along by Pollard included detailed information on the various platforms -- in the air, on land, and at sea -- used by military components of the National Security Agency to intercept Israeli military, commercial, and diplomatic communications. At the time of Pollard's spying, select groups of American sailors and soldiers trained in Hebrew were stationed at an N.S.A. listening post near Harrogate, England, and at a specially constructed facility inside the American Embassy in Tel Aviv, where they intercepted and translated Israeli signals. Other interceptions came from an unmanned N.S.A. listening post in Cyprus. Pollard's handing over of the data had a clear impact, the expert told me, for "we could see the whole process" -- of intelligence collection -- "slowing down." It also hindered the United States' ability to recruit foreign agents. Another senior official commented, with bitterness, "The level of penetration would convince any self-respecting human source to look for other kinds of work." A number of officials strongly suspect that the Israelis repackaged much of Pollard's material and provided it to the Soviet Union in exchange for continued Soviet permission for Jews to emigrate to Israel. Other officials go further, and say there was reason to believe that secret information was exchanged for Jews working in highly sensitive positions in the Soviet Union. A significant percentage of Pollard's documents, including some that described the techniques the American Navy used to track Soviet submarines around the world, was of practical importance only to the Soviet Union. One longtime C.I.A. officer who worked as a station chief in the Middle East said he understood that "certain elements in the Israeli military had used it" -- Pollard's material -- "to trade for people they wanted to get out," including Jewish scientists working in missile technology and on nuclear issues. Pollard's spying came at a time when the Israeli government was publicly committed to the free flow of Jewish emigres from the Soviet Union. The officials stressed the fact that they had no hard evidence -- no "smoking gun," in the form of a document from an Israeli or a Soviet archive -- to demonstrate the link between Pollard, Israel, and the Soviet Union, but they also said that the documents that Pollard had been directed by his Israeli handlers to betray led them to no other conclusion.